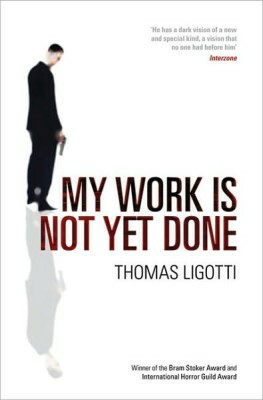 My Work is Not Done by Thomas Ligotti is as bleak as they come; a collection of three stories about corporate culture that makes Kafka feel positively upbeat. The first cut is the title story, a three-part odyssey in the life (and afterlife) of Frank Dominio. It begins in a familiar way, with an office worker who gets a raw deal from his greedy co-workers and ends up without a job. Dominio, who was slightly unhinged and paranoid to begin with, begins to plot a massacre. But something intervenes. The second chapter finds Dominio in Twilight Zone territory, endowed with almost omnipotent supernatural powers. A simple, wholesale slaughter is off the cards; instead, Dominio plots intricate, personalized vendettas against each co-worker who wronged him. One victim is fed to a human trashcan, another is turned into a plastic doll, and so on. It’s surprisingly straightforward stuff from Ligotti, whose work is usually a bit more baroque. There’s some fascination with Dominio’s newfound situation, but mostly the story is about handing down one gruesome murder after another. Nothing wrong with that, of course, and the bleak, uncompromising outrageousness of the story makes for an interesting read. As a Ramsey Campbell novel it would’ve probably even rocked. But with Ligotti one tends to enjoy the mystery and mood more than what happens on the surface, and here both are of a light variety. A Ligotti-lite, if you will. The two shorter stories, I Have a Special Plan for This World and Nightmare Network, are closer to the old Ligotti. The first one is a tale about a corporation that has relocated into a strange town shrouded with a yellow mist, while the other one is a plotless rumination about a corporate environment. Neither is memorable in the way that The Town Manager or The Red Tower from the brilliant Teatro Grottesco were, but nevertheless both are as enjoyable as Ligotti’s “corporate horror” is probably ever going to be. A mixed bag, then, that doesn’t quite reveal Ligotti’s true quality.